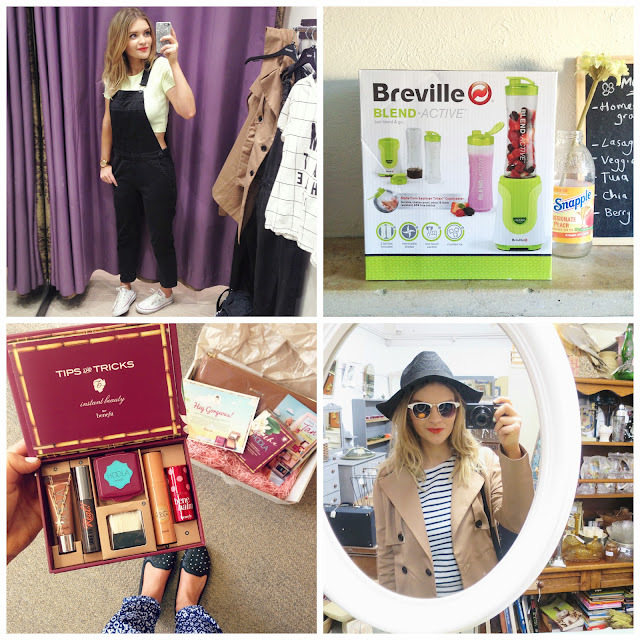 Welcome back to my new feature, the 'Monthly Mini Haul'! My absolute favourite purchase of May has to be those delightful denim dungarees from Topshop. They fit like a dream, can be styled so many ways and feel like a socially acceptable onesie (aka the dream). I also did lots of shopping in the Lanes of Brighton this month and my new white clubmaster sunnies were found in the corners of 'Snoopers Paradise', which is nothing short of a giant jumble sale of gems. If you like the sound of that, watch out for my Brighton VLOG coming tomorrow #cheekyplug. Moving on to makeup I was kindly sent the new 'Do The Hoola' kit from Benefit, which not only includes the new liquid Hoola, but also has a mirror with my name on- those Benebabes are cuties! Finally, on the lifestyle front we have the Breville Blend Active which has already created a host of feel good fruity smoothies as well as more taste good Oreo milkshakes. At just under £30 I'd highly recommend. What have you been haulin' this month? Those dungarees are so pretty, you look lovely Meg. The Benefit palette, is so cool! I love their small kits because you can try out different products without having to buy them in full size directly. Love those dungarees! The little Benefit kit looks adorable as well! Love those dungarees and sunglasses, they really suit you :) Can't wait to watch your Brighton vlog! You look so pretty and I need that blender in my life haha Love the sunglasses! Love the dungarees, so cute with the converse. And I have that blender, it's amazing, so good at making iced coffee aswell!